Lovely card. Image is so cut and I love the ribbons. Thanks so much for playing along in my word play saturday challenge! Sehr schön Karte. Danke für spiele at Robyn's Fetish Challenge. What a sweet image. Lovely card. Thank you for joining us at AGOAC. Very cute easel card. Thank you for stopping by the neighborhood and visiting us at 613 Avenue Create. Hope to see you again real soon. This is such a sweet card, the soft colors and double ribbon/bows are fabulous! Thanks so much for joining us at Cards In Envy this fortnight! Gorgeous card and the image is so cute. Thank you for joining us at Challenges 4 Everybody. Love the two little bow, they are gorgeous details for this beautiful project. Thanks for playing with us at Gingerloft. Pretty card! Beautiful color combo! Thanks for playing along with us Card mania challenges! Love how the ribbons coordinate with the dots. Thank you for playing at Cards in Envy! This is such a pretty easel card! I really love the DP you have used!!! Great image and fabulous coloring. 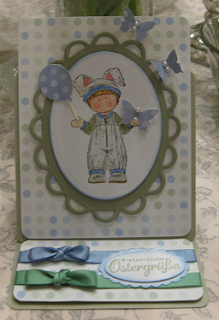 A sweet easel card, cute image and lovely layout, Thanks for joining in the challenge at Gingerloft this fortnight and hope to see you again.